Evolving from hypothesis-driven light microscopy imaging methods, the high-content screening (HCS) platform integrates fluorescent microscopy, application software, and bioinformatics with necessary instrumentation to automate cell analysis in discovery-driven research. The emergence of automated cellular systems allows rapid visualization of large groups of cells and phenotypic analysis in a quantitative manner. 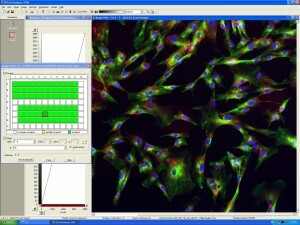 The automated screening and analysis of intact cells is able to provide spatially resolved information and can extract features at the cellular and subcellular level. Thus, HCS can be applied to a variety of research areas, including, but not limited to, primary screening, biomarkers and target identification and cytotoxicity. A HCS platform can process hundreds of thousands of compounds in high-throughput screening (HTS) mode. 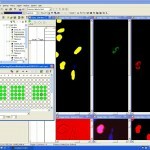 Within Discovery Biology, the Opera (Perkin Elmer) and InCell (GE) high content imaging systems, both with their respective image processing and analysis software, namely Acapella and INCell Developer, are routinely in use. These software packages are primarily used for image acquisition and analysis. Automation is achieved through integrating several high-end computing processors, designed to perform in parallel, which ensures massive data handling ability in the Tera-byte scale. This high-end system is also scalable and features automatic back up to a central storage server. For algorithm development related to high-content analysis (HCA), both Acapella and INCell Developer provide a drag-and-drop based graphical user interface (GUI) platform for analysis. Further to this, Acapella provides scripting options for the developers. To cope with the ever growing customisation requirements for supporting advanced assay development, we also utilize open-source platforms for image analysis and image processing in an automated architecture. 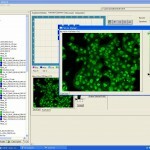 Platforms such as ImageJ software are used to overcome restrictions of existing software systems in the development of novel, effective and efficient algorithms. This developmental degree of freedom enables us to handle multidimensional image processing and analysis. Some of the algorithmic challenges Discovery Biology are solving include 3D-spheroid size analysis, 3D-spheroid spatial receptor distribution, 3D nuclear receptor translocation, scalable and automated cytosolic spot analysis and improved region of interest thresholding.